St John the Baptist church presents an oldest existing wooden church in the Upper Orava. Its rich polychrome paintings and numerous sculptures make it an all the time open illustrated Bible. The center of the baroque-style 18th century high altar displays Pieta – a sculpture depicting Virgin Mary cradling the dead body of Jesus. 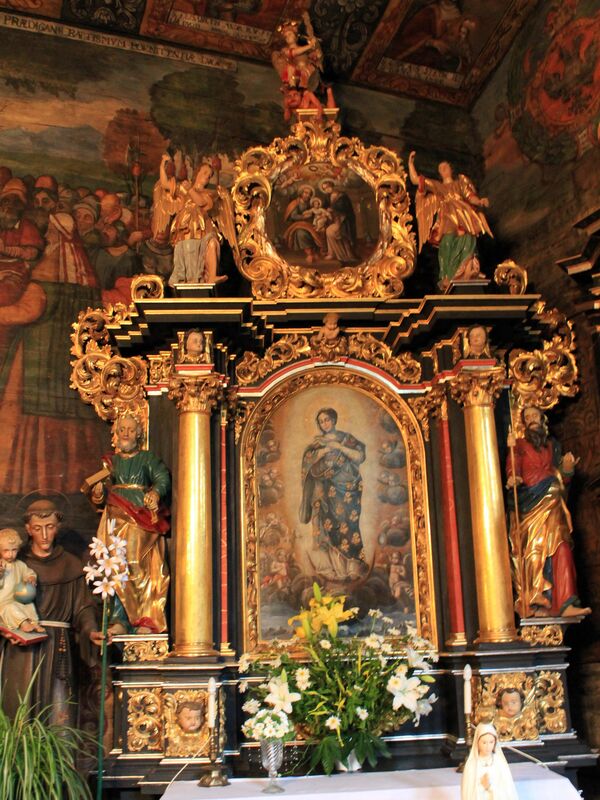 On the left side of the altar there are life-size figures of Hungarian kings – Stephan and Ladislaus (Wladyslaw). On the right side correspondingly the Polish saints St. Adalbert (Wojciech) and St. Stanislaus (Stanislaw) - both from the early days of Christianity in Poland. Or may be this is just a thoughtful and practical implementation of one of the fundamental Commandments usually escaping our attention? In the upper part of the high altar there is a hexagonal painting showing a beautiful scene of Virgin Mary holding two children – Jesus and John (future St. John the Baptist). High Altar with Pieta in the center. The picture is accompanied by the figures of: Saint Margaret and Saint Barbara (from the left) then Saint Catherine from Alexandria and Saint Elizabeth from Hungary (from the right). From the two baroque-style lateral altars, the one on the left is dedicated to the Virgin Mary while the right one presents the scene of Crucifixion of Jesus (apparently the copy of one of the famous paintings by Rubens). Lateral Altars in the church of Orawka. The beautiful pipe organ located on the left wall of the church is in its original form dated from 1670’s. Not surprisingly, paintings next to the organ display angels playing various musical instruments to the glory of God. Under the gallery among numerous pictures portraying saints you will find the one of St. John Nepomucen (Jan Neponuk). He was widely respected by Oravians for his miraculous protection from flooding (it is believed that at the order of the king of Czech – Vaclav IV he was thrown from the Charles Bridge to the Veltava River). ....ny w......sze dla występku twego. A grob ciałv moiemu w sercv svy[m] zgotował. Męki moyei bronić cię będzie zawieszona. Source: "Kościół w Orawce" author: Tadeusz M.Trajdos, Hanna Pieńkowska, "Secesja" Kraków 1999. Unfortunately it is impossible for me to translate this old text to English preserving its original message as well as a spirit and “melody of lyrics” behind each word, sentence and strophe…. I’m sure you understand the impossibility of this task…. 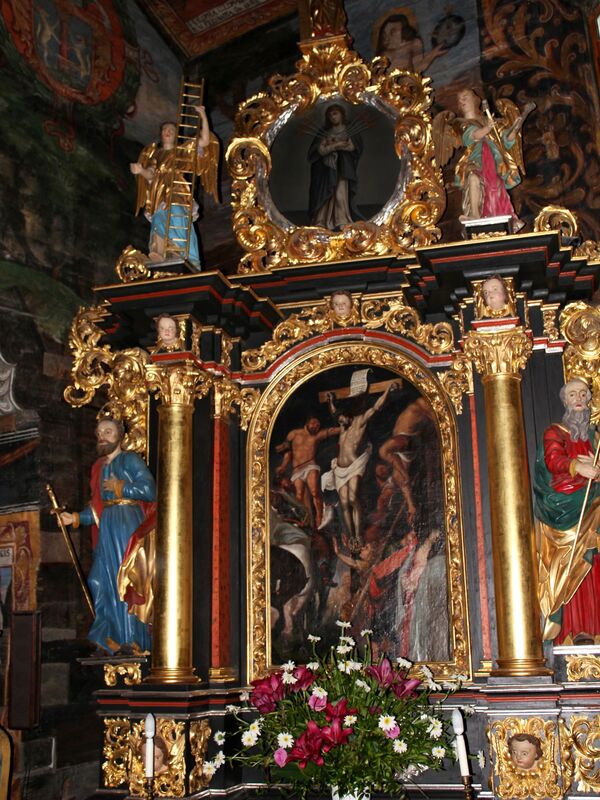 On the left wall, next to the lateral altar dedicated to Virgin Mary you will see a remarkable wooden pulpit. Its rich ornamentation includes sizable sculptures of Four Evangelists. Under the original floor from stones there are few tombs from the early days of the parish. One holds the bodily remains of its first vicar, Fr. Jan Szczechowicz who left this world on May 25, 1659, shortly after the construction of the St. John the Baptist church was finished. Parish cemetery next to the church. 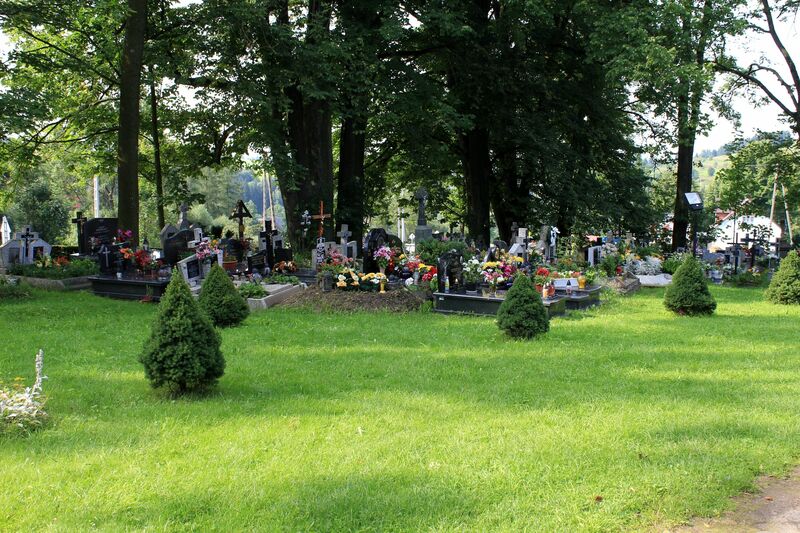 Next to the church there is a cemetery where the generations of Orawka’s parishioners found the eternal resting place. The cemetery is dominated by the figure of Mother of God standing on the column with St. Donald and St. Florian on the sides (dated from 1758). Well, that was the short description of the church of St. John the Baptist in Orawka, allowing you to follow and better understand the gallery of pictures presented below. I’m aware however that even these descriptive words and photos may be not enough to express the atmosphere you may experience while visiting the church in person. After entering the church the first thing you realize is an almost total darkness since there are only very few small windows! 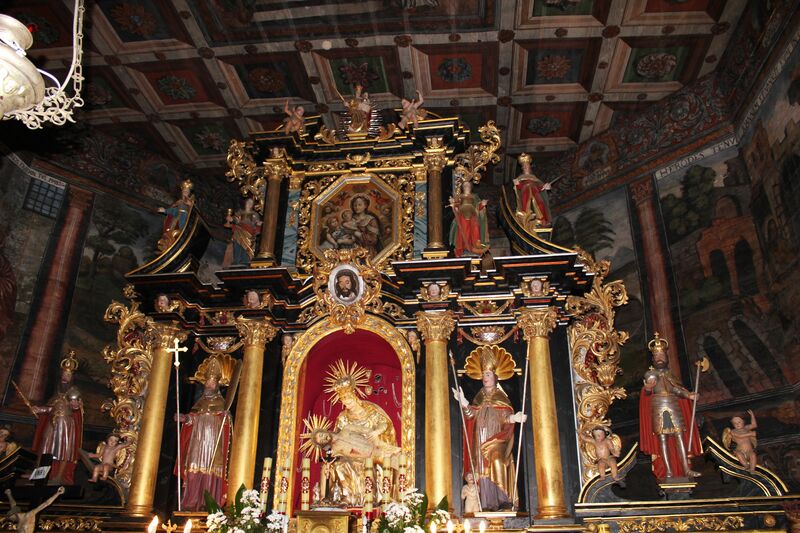 Then, slowly accommodating your eyes to the poor light conditions you will realize the overwhelming density of spiritual symbols, life-size sculptures, vibrancy of rainbow-colored paintings and richness of ornamentation – all concentrated in the small interior shell of the church. Frankly it will be difficult to find an empty square-inch on the walls or ceiling surface. One could say – in front of your eyes opens a beautifully illustrated Bible! Needless to say that all that spectacular visual art is accompanied by a “music” of the crunching and creaking wood… It is an amazing feeling! The church in Orawka together with several other, centuries old wooden churches still existing in southern Poland (Binarowa, Lipnica Dolna, Dębno, Rabka, Sękowa, Haczów etc…) belongs to the most enchanting medieval sacral sites in this part of the world. Most of them are UNESCO- listed as World Heritage Sites (Orawka’s church is on the “waiting list”). Usually during summer time a series of concerts is organized at some of these architectural and religious marvels under the common name: “Music sealed in the Wood”. Frankly, it will be hard to find better name for these concerts, indeed these wooden churches witnessed a long, sometimes devastating but also colorful history of the Upper Orava…. If they could only talk or sing ….. Right - view from the back of the church. Left and Right photos - Between the top part of the Altar and the upper part of the pulpit you can see on the wall the crest of Ferdinand III. Out of 55 wall paintings of saints, kings and nobility, the overwhelming majority are representing Hungarians or subjects of the Hungarian Crown. Right - upper part of the Altar of Virgin Mary. I hope that these St John the Baptist church pictures speak very well for themselves showing the richness of ornamentation and at the same time an incredible devoutness of faithful. I have to admit however that sometimes (especially in the case of spiritually “loaded” places like this one) - visiting the place may offer more intense feelings. At least that is my impression after visiting St. John the Baptist church in Orawka. Most of such places are not only far from the roads travelled by tourists but also absent from the first pages of the mainstream news. May be that keeps them so well anchored in the past and preserving the centuries old atmosphere of little villages? I hope that you will remember this church and having the opportunity to travel down the road E77 you will stop in Orawka to live this experience personally. If at any time of this virtual guided tour you would like to visit another church, you can select it from the page City and more... under the section Churches, Temples, Pagodas..... or even better, from the list of Religious Places displayed on the top of the right column.